Sorghum, family Graminae, and tribe Andropogoneae, evolved and slowly spread primarily within the confines of the African subcontinent. From the four major forces of evolution, selection, mutation, random genetic drift and migration, arose the wild representatives of S. bicolor subspecies verticilliflorum that are still present today. Though humans appeared on the scene about 2 millions years ago, their role in the evolution of sorghum was probably limited to that of a physical agent of dispersal and occasionally an agent of selection. Le sorgho, famille des graminees et tribu d'andropogoneae, a evolue et s'est rependu progressivement d'abord dans les limites du continent africain. En plus de quatre forces majeures de l'evolution dont la selection, la mutation, la derive genetique due au fait du hasard, et la migration, il y a l'apparition de representants de forme sauvage des sous-especes de S. bicolor telles les verticilliflorum qui sont encore presents aujourd'hui. Malgre la presence de l'etre humain il y a deux millions d'annees, son role dans l'evolution d u sorgho etait probablement limite a celui de l'agent physique de dispersion et occasionnellement a celui de l'agent de selection. Sorghum [Sorghum bicolor (L.) Moench] is the fifth most important cereal crop in the world after wheat (Triticum sp. ), rice (Oryza sativa, Oryza glaberrima), maize (Zea mays), and barley (Hordeum vulgare). In 1992, the world planted 45.4 million ha of sorghum with an average yield of 1,532 kg ha^-1 (FAO, 1994). Over 80% of the area devoted to sorghum lies within Africa and Asia, where average yields were 766 and 1,171 kg ha^-1, respectively. In comparison, sorghum was planted on approximately 5.4 million ha in the United States, with an average yield of 4,567 kg ha^-1 (USDA, 1993). Sorghum's value to U.S. farmers in 1992 was over 1.7 billion dollars. Production areas have remained constant within Asia and Africa but have decreased within the Americas in the last 10 years. Sorghum provides an important component to the diets of many people in the world in the form of unleavened breads, boiled porridge or gruel, malted beverages, and specialty foods such as popped grain and beer. Syrup is made from sweet sorghum. The crop is also used for building material, fencing, fodder for animals, or for brooms (House, 1985; Doggert, 1988). In the United States, sorghum grain is used primarily for livestock feed and stems and foliage for green chop, hay, silage, and pasture (House, 1985). Sorghum is currently grown in over 66 countries. The question becomes, how did a crop that was probably ennobled in northeastern Africa disperse to so many different countries, environments, and climates? Sorghum fails under the family Graminae, tribe Andropogoneae. It was first described by Linnaeus in 1753 under the name Holcus. Moench later separated the genus Sorghum from the genus Holcus (Clayton, 1961). Several authors have discussed the systematics, origin, and evolution of the crop (Snowden, 1936; Huckabay, 1967; de Wet and Harlan, 1971; de Wet et al., 1972; Harlan, 1975a and Doggett (1988) provides an excellent overview of the present-day classification. Snowden (1936) presented the most complete classification of cultivated sorghums, and classification schemes since then have been based on this monumental work. Harlan and de Wet (1972) proposed a simplified classification of cultivated sorghums that most present day breeders have come to recognize and utilize. This was further developed by de Wet in 1978. In these papers, the authors recognized three species in the section Sorghum, two rhizomatous taxa, S. halepense and S. prapinquum, and S. bicolor, representing all annual wild, weedy, and cultivated taxa. Sorghum bicolor was further broken down into three subspecies; S. bicolor subsp. bicolor, S. bicolor subsp. drummondii, and S. bicolor subsp. verticilliflorum formally subsp. arundinaceum. Sorghum halepense is a perennial plant with well developed, creeping rhizomes. It is a native of southern Eurasia, east to India, and has been introduced as a weed to all warm temperate areas of the world (de Wet, 1978). Introgression with cultivated sorghums in the U.S. has created one of the most noxious weeds,johnsongrass. Sorghum propinquum is another perennial with stout rhizomes and occurs primarily in Ceylon (Sri Lanka) and southern India. It is also found between Burma eastward to the islands of southeastern Asia. Although S. propinquum and S. bicolor are fully fertile and belong genetically to one species, spatial isolation of this perennial to the annual S. bicolor has justified its taxon as a species (de Wet, 1978). S. bicolor has two wild subspecies associated with it, S. bicolor subsp. drummondii and S.. bicolor subsp. verticilliflorum. Subspecies drummondii is an annual weed associated with both cultivated grain sorghums and their wild relatives. Subspecies drummondii occurs primarily in Africa and hybridizes with subspecies bicolor and all wild relatives to produce shattercane type weeds. De Wet and Prasada Rao ( 1986, from Doggert, 1988) recognized four main races of weedy types under S. bicolor subsp. verticilliflorum. The four races consist of verticilliflorum, arundinaceunz, virgatum and aethiopicum. The races are so closely related morphologically and ecologically that they do not deserve formal taxonomic status and are considered to be essentially well defined ecotypes (de Wet, 1978). In 1971, de Wet and Harlan published a distribution map of the wild representatives of S. bicolor subspecies verticilliflorum (Figure 1). This map was based on extensive field evaluation and correlated with studies of the collections filed in the herbaria at Kew, British Museum, Paris, Brussels, Florence. Nairobi, Salisbury. and Pretoria. Subspecies aethiopicum is associated with the dry areas of West African savannas and extends from Mauritania to western Ethiopia. It is characterized by small, short inflorescence with strongly divided, sub-erect branches. Along the moist tropical forests of the Guinea coast and the Congo, the subspecies arundinaceum is found. It is characterized by large, open inflorescence, with flexible branches that are undivided at the base. Subspecies verticilliflorum is closely associated with arundinaceum and is a common grass found across most of the African savanna. The subspecies is characterized by spreading, divided branches and a large inflorescence. Finally, the subspecies virgatum, with a narrow inflorescence and suberect branches can be found along irrigation ditches and streambanks in central Sudan and extends along the Nile northward to Cairo (de Wet and Huckabay, 1967; de Wet and Harlan, 1971; de Wet, 1978; Doggert, 1988). Given the fact that the four races of S. bicolor subspecies verticilliflorum are so closely related, one can assume that these races and their distribution were greatly impacted by the four major evolutionary forces that influence the genetic processes of evolution:selection, mutation, random genetic drift, and migration. Figure 1. Distribution of wild sorghums ( Sorghum bicolor subsp. verticilliflorum) in continental Africa. The dashes show approximate limit of present clay tropical forest. Evolution is a process that is a consequence of the stimulation of an organic shift resulting from a response to a catalyst or stress and the fixing of that shift in the population. This may imply a continuous and gradual variation until a threshold point is reached and an isolation response is initiated and fixed. In 1859, the idea of continuous and gradual variation in plants was introduced by Darwin (1860) in his chapter dealing with causes of variability in the book On The Origin of Species. It seems clear that organic beings must be exposed during several generations to new conditions to cause any great amount of variation; and that, when the organization has once begun to vary, it generally continues varying for many generations. Evolution as a process may be a more radical shift as suggested in the phrase punctuated equilibrium (Gould and Eldridge, 1977). Variations build within a population until some threshold value is achieved, causing reordering or shifts within that population. In some cases, this occurs in small populations that give rise to the founder effect and may be one of the reasons that the fossil record supports the idea of punctuated equilibria. These shifts are made possible through the evolutionary mechanisms of selection, mutation, genetic drift, and migration. could argue that the four races of subspecies verticilliflorum were derived from a single common ancestor in which natural selection played a crucial role in the survival and increase of specific genetic combinations that led to successful survival rates within the savannas, tropical rain forests, dry savannas, and river and streambanks in Africa and, therefore, the apparent rise in these four races within these particular ecological zones. It must be remembered, however, that in order for selection to be successful, variation within the genetic composition of the population must be present. One of the most potent forces in the creation of genetic variation within populations is mutation. Mutations can be as simple as a single point mutation that changes a given allele A to the allele a in which the consequences of such a change can be enormous. Allele A may condition susceptibility to a pathogen or particular stress, while the allele a may impart resistance to these stresses (for a more complete discussion on mutation, see Levine, 1969). In the context of the wild sorghums and their dispersal throughout Africa, mutations must have given rise to alleles that provided the variation within these population to adjust to the different environments and conditions in which each race is located. Random genetic drift can be defined as random fluctuations in gene frequency that arise as a consequence of sampling error in the reproductive process (Elseth and Baumgardner, 1984). Several authors have discussed genetic drift and its effect on gene flow, effective population size, and interactions with selection. Discussion has also been made for estimating genetic drift ( Nei and Tajima, 1981; Gillespie, 1985; Heywood, 1986; van Dijk, 1987; Nagylaki, 1990). "In a finite population, any gene frequency will have a sampling variance which is inversely related to population size; so the smaller the population the larger the variance. Therefore, by chance, a gene frequency can drift up or down over a number of generations and the likelihood of it moving a long way is greater in small populations than in large ones. At the limit, an allele may be either fixed (p=1) or lost (p=O) without the help from selection for fitness effects. On evolutionary time scales the effect is thought to be quite important, even in relatively large populations. Obviously, alleles already at low frequency are especially at risk of random loss". It is conceivable. therefore, that the wild sorghum populations within Africa have, through random drift, fixed and lost alleles throughout the long process of evolution and population development simply by chance. Migration affects gene frequencies within populations through the exchange of alleles and its significance in changing those frequencies lies on the degree to which those populations are related. Wild populations, therefore, have developed unique dispersal mechanisms to increase the likelihood of their survival. Wild sorghums share many of the same characters as wild einkorn in that they have long, robust awns, backwards pointing hairs on both the glumes and rachis and clean semi-circular disarticulation scars (Hillman and Davies, 1990). The arrow-like morphology of the spikelets, with their smooth points, springy awns, long straight glumes, and backward-pointing barbs and hairs, ensures that they quickly penetrate any surface litter and wedge themselves in cracks in the ground where at least some of them remain safe from birds, rodents and seed-eating ants (Hillman and Davies, 1990). Wild populations, however, are dependent upon natural modes of dispersal and migratory effects would have arisen over very long periods of time. Dispersal would have relied on such mechanisms as shattering and perhaps dormancy 10 insure survival of individuals, while physical agents of dispersal would have been primarily animals and birds and, in some cases, flowing water. Consequently, the distribution of the subspecies verticilliflorum arose from the interaction of all four forces over an extremely long period of time. Mann et al. (1983) hypothesized that the origin and early domestication of sorghum took place in northeastern Africa, north of the Equator and east of 10' E lat., approximately 5000 years ago. New evidence, however, may place the origin at 8000 years before present (BP), 3000 years earlier than previously thought and 10-15 ' lat. further north than had been reported earlier. Wendorf et al. (1992) reported that carbonized seeds of sorghum, with consistent radiocarbon dates of 8000 years BP, were excavated at an early Holocene archaeological site E-75-6, at Nabta Playa, near the Egyptian-Sudanese border. The four major forces of nature still continue to play a great role in the development of this crop; however, the advent of humankind has elevated the roles of selection and dispersal and their importance to the dynamics of sorghum's evolution. Therefore, to comprehend the changes in sorghum, one must understand both the domestication and the agricultural process and how they have affected selection and migration. Many authors have argued that the agricultural process was a gradual one and are admitting that the origins of agriculture will be difficult to uncover (Bender, 1975; Steensberg, 1977; Harlan, 1986; Chang, 1989; Costantini, 1989; Hallam, 1989). Agriculture, they say, arose in different areas at different times by different pathways. Zeven and de Wet (1982) summarized the development of crops as passing from wild plants through various stages of crop improvement by plant breeding techniques to agricultural entities. Rindos (1984) defined agriculture as environmental manipulations within the context of the human co-evolutionary relationships with plants. This is important because it implies that agriculture is a system, a cultural construct, and that it involves a symbiotic relationship between humans, plants, and animals. Kimber's (1970, 1973) earlier schematic most clearly defines the agricultural process for plants and people (Figure 2). Agriculture, therefore, is a dynamic, (human) evolutionary (plants and animals) system which continues developing an interactive relationship between humans and their environment. Hillman and Davies (1990) refer to domestication of a plant as that process which (a) occurs under cultivation in populations of early wild-type crops (sown originally from seed gathered from wild stands), (b) selectively advantages rare mutant plants lacking features (especially reproductive features) necessary for their survival in the wild, and (c) continues until these mutant types dominate the crop population and the original wild types are eliminated, i.e., the process which renders crop populations dependent on human intervention for their survival, through the loss of wild-type adaptive features. Primitive domesticated sorghums must have differed from their wild counterparts in several morphological and physiological characters such as awn robustness, glume size and rigidity, grain size and shape, number of fertile florets, photosynthetic rates, and hairiness of the panicle and glumes. The two most significant adaptive changes would have been the loss of wild-type dormancy and shattering. The loss of an abscission zone at the rachis, panicle, or spikelet nodes is thought to be initiated in sorghum by allelic changes at two loci (Mann et al., 1982). on earth at low population densities for over 2,000,000 years and that hunting and gathering were the successful and dominating adaptation. If agriculture began a mere 10,000 years ago, humans have pursued the idea for a mere 0.005% of our life's history. The mere act of gathering, however, did not significantly impact on the evolution of crops per se. Harlan (personal communication), based on several years of experimenting with different strategies of gathering, believes that the mere act of gathering would not have shifted gene frequencies within wild populations in any significant way. Gatherers, therefore, could be viewed as part of the natural system in which wild sorghums would have developed. Their role simply may have been as another source of physical agents of dispersal. Their role, however, was of critical importance in the domestication of sorghum. Humans began to create new habitats, disperse seed, protect seed and wild stands, and systematically harvest and cultivate those stands. It is from a process such as this that Hillman and Davies (1990) argue that "Man's (or more probably, Women's) first cereal crops must, therefore, have been sown from seeds gathered from wild stands, and the first cereal crops must have been essentially of the wild type. It was, therefore, in the course of cultivation that domestication occurred". Here we begin to see the profound effect humans had on crop evolution in terms of their impact on both selection and dispersal. In their elegant paper entitled 'Measured domestication rates in wild wheats and barley under primitive cultivation, and their archaeological implications' Hillman and Davies (1990) show that, through unconscious selection, the initially rare semi-tough-rachised (domestic) phenotypes of wild einkorn could have achieved fixation within 20 to 30 generations. Their same arguments could be applied to sorghum and its wild progenitors. Vavilov ( 1951 ) proposed that centres of origin must contain great variation within a plant species and classified these variations in great detail. Using these criteria, he established eight centres of origin of agriculture. Vavilov indicated that Ethiopia was a centre of diversity; centre of origin for sorghum. Harlan ( 1971 ) expanded on Vavilov's work and proposed that agriculture originated independently in three different areas and that, in each case, there was a centre of origin and several non-centres in which activities of domestication were dispersed over a spatial span of 5,000 to 10,000 kilometers. Harlan (1975a) argued that sorghum was an example of a non-centric crop. Its distribution of variation did not lend itself to a specific centre of diversity nor a centre of origin. In fact, the definitions of the agricultural process and domestication itself present strong arguments to supplement these ideas. The process of agriculture. would have allowed for such non-centres to have developed. Sorghum bicolor subspecies bicolor contains all of the cultivated sorghums. Harlan and de Wet (1972) partitioned the primary gene pool, Sorghum bicolor (L.) Moench into five major races, bicolor, guinea, caudatum, kafir, and durra and 10 intermediate races or all combinations of the basic races. Based oil distribution information of the races, Harlan and Stemler (1976) began to reconstruct the history of cultivated sorghum's origins and dispersal (Figures 3 and 4; for more detailed distribution maps see Harlan. 1975b). Figure 3. Proposed regions of domestication of sorghum races and early dispersal to secondary centres. Figure 4. Proposed later movement of sorghum. The race bicolor is thought to be the most primitive and it is believed that it arose from the subspecies verticilliflorum complex; however, Harlan (1975b) is unsure as to its centre of origin (for a more detailed review of the dispersal and development of all the races, see Doggett, 1988). Though Harlan and Stemler (1976) show an origin of Early Bicolor in their map (Figure 2), Harlan (1975b) indicated that this area was selected because: "(1) archaeological evidence suggests African agriculture originated north of the equator; (2) the West African race of wild sorghum is a forest grass with an adaptation quite different from that of the crop; and (3) the region outlined includes the most massive stands of wild sorghum adapted to a savanna habitat north of the equator". Since its domestication. bicolor has spread throughout Africa in areas where sorghum ~s grown and is also located in Asia from India to Indonesia (de Wet and Price, 1976; for complete morphological descriptions of the five maj or races. see Mann et al., 1983). Harlan and Stemler (1976) proposed that guinea sorghums originated some 3000 B.C. Porteres ( 1962, from de Wet et al., 1972) proposed that the race guinea arose independently from the wild race arundinaceum (primarily a forest grass). There were two primary reasons behind his rational;( 1 ) the guineas are grown extensively in the forest regions of West Africa, and (2) it is sympatric with the wild arundinaceum. However, de Wet et al. (1972) could not find closer affinities with arundinaceum than the verticilliflorum aethiopicum complex. Though the guinea race is grown in the forest, it is primarily a savanna cereal and probably originated in the West African savanna as an early selection out of the original bicolor race. It extends across the savannas of Africa and is grown widely in South Asia. It is also present in high humid areas of Southern Africa and de Wet et al. (1972) speculate that since the guineas of West and Southern Africa are so similar, it is best to assume West Africa as the place of origin for all guinea sorghums. Stemler et al. (1975) showed that the race caudatum was closely associated with the speakers of the Chari-Nile languages in Africa, and is widely distributed throughout northeastern Nigeria, Chad, Sudan, Ethiopia and Uganda. For the most part, the caudatum sorghum is restricted to the area of early bicolor domestication and, because of this, it is thought to have been derived from an introgressed cross between an early bicolor and the wild sorghum complex (Harlan and Stemler, 1976). Doggert (1988~ states that the race must be younger than guinea or durra because it does not occur in India and did not arise from all the guinea and durra crosses that must have occurred there. The caudatum race is one of the most important races agronomically and provides high yield and excellent seed quality and has become one of the most important sources of germplasm in modern breeding programmes throughout the world. The race kafir is the dominant cultivated sorghum in the southern region of Africa and is widely distributed in northern Nigeria. Though there is no strong evidence to support an apparent centre of or~gin, it is thought that it was derived from early bicolor of northern Africa and carried south, primarily by Bantu speakers of Africa (Harlan and Stemler, 1976). De Wet and Huckabay (1967) felt that its distribution and morphology would suggest closer affinities to the wild verticilliflorum, and electrophoretic data would seem to strengthen that argument (Shechter and de Wet. 1975). Snowden (1936) suggested that the durra may have arisen from introgression in the wild aethiopicum. Harlan and Stemler (1976) felt that durra sorghums were selected from early bicolor which had been carried to India before 3000 B.P. Doggott (1988) argues convincingly that durras originated in Ethiopia since the whole sequence of wild type-bicolor-durra-bicolor-durra is clearly represented in this country. He suggests that early bicolors introgressed with wild forms, adapted to drier conditions, and led to the development of the race durra. The durras moved westward through Sudan and began to occupy the drier regions below the southern margin of the Sahara. Doggert (1988) then suggests that they moved through the Horn of Africa and worked their way into India. The cultivated sorghums of today are a complex and important crop and truly one of the great cereals of the world. Until approximately 10,000 years ago, the crop developed and evolved within the confines of a natural setting in which the four major forces of evolution played equally important roles. As humans began the process of agriculture, unconscious and conscious selection and migration became dominant players in shaping the history and dispersal of the crop, for it is not until the act of domestication (an integral part of the agricultural process) that we see the development of cultivated and highly complex forms of sorghum. Humans continue to play a vital role in the evolution of cultivated sorghums, and plant breeders have pushed the crop to higher levels and yield potential through continued selection and migration of genes. Ironically, sorghum has shaped us too, for as Hatfan (1975b) so eloquently states, 'man has become so utterly dependent on the plants he grows that, in a sense, the plants have "domesticated" him'. Bender, B. 1975. Farming in Prehistory: From Hunter-Gathers to Food Producer. St. Martiffs Press, New York, NY, USA. Chang, T.T. 1989. Domestication and the spread of the cultivated rices. In: Foraging and Farming. Harris, D.R. and Hillman, G.C. (Eds. ), pp. 408-417. Unwin Hyman Ltd., London, UK. Clayton, W.D. 1961. Proposal to conserve the generic name Sorghum Moench. (Gramineae) versus Sorghum Adans (Gramineae). Taxonomy 10:242. Costantini, L. 1989. Plant exploitation at Grotta del l'Uzzo, Sicily: New evidence for the transition from Mesolithic to Neolithic subsistence in southern Europe. In: Foraging and Farming. Harris, D.R. and Hillman, G.C. (Eds. ), pp. 197-206. Unwin Hyman Ltd., London, UK. Darwin, C. 1860. On the Origin of Species. J.M. Dent & Sons Ltd., London, UK. de Wet, J.M.J. 1978. Systematics and evolution of sorghum. American Journal of Botany 65:477-484.
de Wet, J.M.J. and Harlan. J.R. 1971. The origin and domestication of Sorghum bicolor. Economic Botany 25:128-135.
de Wet, J.M.J., Harlan, J.R. and Kurmarohita, B. 1972. Origin and evolution of guinea sorghums. East African Agriculture and Forestry Journal 38:114-119.
de Wet, J.M.J. and Huckabay, J.P. 1967. The origin of Sorghum bicolor. II. Distribution and domestication. Evolution 21:787-802.
de Wet, J.M.J. and Prasada Rao, K.E. 1986. Wild sorghums and their significance in crop improvement. Proceedings of a Sorghum Conference, 20-23 Aug. 1986, Shenyang, China. de Wet. J.M.J. and Price, E.G. 1976. Plant domestication and indigenous African agriculture. In: Origins of African Plant Domestication. Harlan, J.R., de Wet. J.M.J. and Stemler, A. (Eds. ), pp. 4-53-464. Mouton Publishers. The Hague. Doggett, E. 1988. Sorghum. John Wiley & Sons, Inc., New York, NY, USA. Elseth. G. D. and Baumgardner, K.D. 1984. Genetics. Addison-Wesley Publ. Co., Reading, MA, USA. FAO. 1994. Production Yearbook. Food and Agriculture Organization of the United Nations, Rome, Italy. 254pp. Gardner, E.J. and Snustad, D.P. 1984. Principles of Genetics. John Wiley & Sons, Inc., New York, NY, USA. Gillespie,, 3. H. 1985. The interaction of genetic drift and mutation with selection in a fluctuating environment. Theoretical Population Biology 27:222-237. Gould, J.S. and Eldridge, N. 1977. Punctuated equilibria: the tempo and mode 01 evolution reconsidered. Paleobiology 3:45-51. Hallam, S.J. 1989. Plant usage and management in southwest Australian aboriginal societies. In: Foraging and Farming. Harris, D.R. and Hillman, G.C. (Eds. ), pp. 136-151. Unwin Hyman, Ltd., London, UK. Harlan. J.R. 1975a. Geographic patterns of variation in some cultivated plants. Journal of Heredity 66:184-191. Harlan, JR. 1975b. Crops and Man. American Society of Agronomy, Madison, WI, USA. Harlan, J.R. 1986. Plant domestication: Diffuse origins and diffusions. In: The Origin and Domestication of Cultivated Plants. Barigozzi, C. (Ed.). Elsevier, New York, NY, USA. Harlan, J.R. and de Wet, J.M.J. 1972. A simplified classification of cultivated sorghum. Crop Science 12:172-176. Harlan. J.R. and Stemler, A. 1976. Plant domestication and indigenous African agriculture. In: Origins of African Plant Domestication. Harlan, J.R., de Wet, J.M. J. and Stemler, A. (Eds. ), pp. 465-478. Mouton Publishers. The Hague. Heywood, J.S. 1986. The effect of plant size variation on genetic drift in populations of annuals. The American Naturalist 127:851-861. Hillman. G.C. and Davies, M.S. 1990. Measured domestication rates in wild wheats and barley under primitive cultivation, and their archaeological implications. Journal of World Prehistory 4:157-222. House, L.R. 1985.A Guide to Sorghum Breeding. 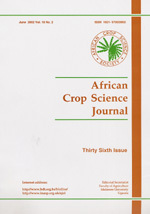 Second edition, ICRISAT, Patancheru 502324, A.P., India. Kimber, C. F. 1970. Blue Mahoe. Economic Botany 24:233. Lee, R.B. and DeVore, I. 1968. Man the Hunter. Levine, L. 1969. Biology of the Gene. The C.V.
Mann, J.A., Kimber, C.T. and Miller, F.R. 1983. The Origin and Early Cultivation of Sorghums in Africa. Bulletin 1454, Texas Agriculture Experiment Station, College Station, TX, USA. Nagylaki, T. 1990. Models and approximations for random genetic drift. Theoretical Population Biology 37:192-212. Nei, M. and Tajima, F. 1981. Genetic drift and estimation of effective population size. Genetics 98:625- 640. Porteres, R. 1962. Bercreaux agricoles primaries sur le continent Africain. Journal of African History 2:195-210. Rindos, D. 1984. The Origins of Agriculture: An Evolutionary Perspective. Academic Press, Inc., New York, NY, USA. Simmonds, N.W. 1979. Principles of Crop Improvement. Longman, London, UK. Snowden, J.D. 1936. The Cultivated Races of Sorghum. Adlard and Son, Ltd., London, UK. Steensberg, A. 1977. The husbandry of food production. In: The Early History of Agriculture. Hutchinson, J., Clark, J.G.G., Jope, E. M and Riley. R. (Eds.). Oxford University Press, London, U.K.
Stemler, A., Harlan, J.R. and de Wet, J.M.J. 1975. Caudatum sorghums and speakers of Chari-Nile languages in Africa. Journal of African History, 16:161 - 183. USDA. 1993. Agricultural Statistics 1992. United States Government Printing Office. Washington D.C., USA. Vavilov, N.I. 1951. The Origin, Variation, Immunity and Breeding of Cultivated Plants. Chronica Botanica Co., Waltham, MA, USA. Wendorf, F., Close, A.E., Schild, R., Wasylikowa, K., Housley, R.A., Harlan, J.R. and Krolik, H. 1992. Saharan exploitation of plants 8,000 years. Nature 359:721-724. Publications and Documentation, Wageningen, The Netherlands.